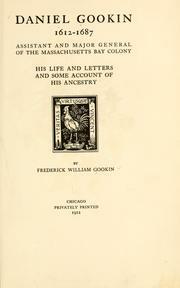 2 editions of Daniel Gookin, 1612-1687 found in the catalog. Add another edition? Published 1912 by Priv. print. [R. R. Donnelley] in Chicago . "Edition two hundred and two numbered copies." This copy not numbered."